Chris and Melissa Bruntlett sold their car in 2010 and have become two of Vancouver’s leading cycling advocates. They and their two children (now aged 9 and 12) cycle virtually everywhere in the city and say they’ve never missed having a car. It is a common perception that you can’t live in Christchurch without owning a private car. Just a decade ago Vancouver was a typical car-dominated North American city with little in the way of traffic calming and not a single protected bike lane in the city centre. Today walking, biking and public transport make up 50% of trips in the City of Vancouver. Chris and Melissa will discuss how Vancouver has dramatically increased walking, biking and public transport; how the Dutch cycling model is being adapted to cities across North America; and how the power of example, via words and imagery can build political and community support for active transport. Doors open at 5.30pm, refreshments are available. Chris and Melissa’s presentation starts at 6pm. Their presentation will be followed by Q&A. 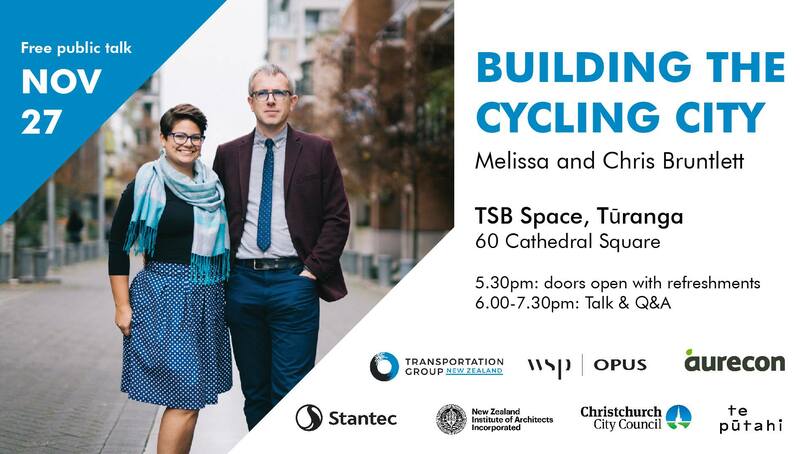 This event is part of Te Pūtahi’s Occasional Series and is presented in partnership between Engineering NZ’s Transportation Group, WSP Opus, Christchurch City Council, Aurecon, Stantec and the New Zealand Institute of Architects’ Canterbury Branch. Melissa and Chris Bruntlett are the co-founders of Modacity, a Vancouver-based creative agency using words, photography and film to inspire happier, healthier, simpler forms of mobility. Together they work with a variety of organisations, including municipal governments, transport agencies, not-for-profits and corporate clients. They work to address the evolving needs of cities, large and small, by championing a variety of mobility options as a way to create successful and more liveable regions. Their new book Building the Cycling City is out now. Copies will be available for purchase at this event.